Why should you use carbide cutting tools? As a shop manufacturer, your tools are the most vital aspect of your business. Are they working hard enough for you? If you’re not using the right materials to cut, grind and shape your products, then you’re not maximizing your potential. Many manufacturers like to use high-speed steel (HSS) cutting tools for most of their work, but we think that this material is outdated. Today we’re going to highlight the benefits and advantages you can get when you switch over to carbide cutting tools. If you’re ready to invest in your company’s future, then carbide is the answer. What is a Carbide Cutting Tool? Carbide is a binary compound of carbon mixed with another element. For cutting tools, the extra ingredient is typically either tungsten (i.e., tungsten carbide) or titanium. The latter is far stronger and more reliable, but it is more expensive, so that can be a deciding factor. When choosing the right carbide cutting tools, you can either pick between those that are tipped in the substance (either tungsten or titanium), or you can get a tool that is made entirely of this material. For our money, we believe that carbide tipped cutting tools are much better overall. The reason for this is that these tools still use steel for the core components, which is stronger and more reliable than solid carbide. The issue with solid carbide tools is that they are prone to fracturing. While the metal is resilient and keeps a clean cutting edge (more on that later), when it’s all there is, it loses a lot of its strength. Overall, you can get a lot more mileage out of tools with carbide tips, making them the better choice for most manufacturers. Initially, the cost of switching over to these tools can seem expensive and unnecessary. However, over time you will wind up saving a lot of money, which is why they are such an excellent investment. But why are carbide cutting tools better than HSS? It comes down to heat and general wear and tear. Carbide (either tungsten or titanium) is much better at dissipating heat than steel. Thus, when using these tools, you don’t have to stop as often to allow the machinery to cool off. Also, this dissipation helps the material stay stronger because it doesn’t change the structure of the metal. The other reason that carbide cutting tools are cost-effective is that they last longer when compared to steel. For the most part, titanium carbide tips are going to offer the most mileage and cutting power, so it may be worth the additional expense. As we mentioned, carbide-tipped cutting tools are much better than solid carbide options. One of the primary reasons we prefer the former is that it’s easier to replace the tips than it is to buy a whole new tool. When using solid carbide, it can fracture, which means that you have to find a replacement right away. However, when you have a tipped model instead, all it takes is grinding off the old carbide and renewing with a fresh layer. You can still keep the integrity of the tool intact, and the process is much cheaper in the long run. 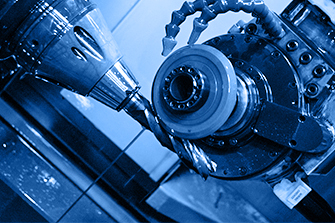 Overall, carbide-tipped cutting tools have much lower maintenance costs and issues, which is why they are so effective. One crucial element of a carbide cutting tool is that the edge is going to stay sharper for longer. Unlike steel that can wear down almost immediately, the carbide won’t break down or start to get dull for a while. Because it maintains a sharper edge, that also means that you get a cleaner, neater finish. Whether cutting hardwood or metal, having cleaner results will save you both time and money. Rather than having to buff the imperfections out after the fact, your pieces are going to be ready for service almost immediately. Also, when cutting wood, carbide tools don’t damage the grain as much either. Compared to steel, you are going to get a lot better results with carbide. When you combine the durability of steel with the expert finishing power of carbide, you get a tool that is built to last. We already mentioned that you can replace tips without swapping out for a new tool, so a high-quality carbide-tipped model is going to outlast even the best HSS option. Once again, the investment for changing over to carbide may seem pricey at first, but you are getting a lot of value in the end, making it a much better choice for any manufacturer. Whether you’re using a CNC grinder or doing precision cutting, you will get incredible results when you use carbide cutting tools. If you’re tired of replacing your high-speed steel tips over and over again, now is the perfect time to see how carbide can transform your business.